Yes, people have done terrible deeds in the name of Christ, but they were against the teachings of Christ. Some of the Crusaders committed atrocities that couldn’t be more contrary to the teachings of Christ. They were the ones who “hijacked” a religion, Christianity, by disobeying what Christ taught. But contrary to the president’s assertions, this is not the case with Islam. Islam is not being “hijacked”—it is being obeyed. The terrorists are following the teachings of the Qur’an and the example of Muhammad. Since the President said that, “no god condones terror,” I can only assume that he hasn’t gone to the original source documents—the Qur’an. The Qur’an commands Muslims to “strike the heads” off the infidels (Sura 8:12); to “strike terror into the hearts of the enemies of Allah” (Sura 8:60); and to “slay the idolators wherever you find them” and to “prepare them for every ambush” (Sura 9:5). What if the “infidels” resist? Sura 5:33 prescribes the punishment: “The punishment of those who wage war against Allah and His Messenger, and strive with might and main for mischief through the land is: execution, or crucifixion, or the cutting off of hands and feet from opposite sides, or exile from the land: that is their disgrace in this world, and a heavy punishment is theirs in the Hereafter.” These cheery tactics from “the religion of peace” find a home with ISIS and with a significant minority of Muslims today. Not only does the Qur’an command this kind of treatment, Muhammad conducted it. According to The Life of Muhammad (LOM), a biography that’s considered an authority on Muhammad’s life, Muhammad personally beheaded approximately 700 Jewish male captives and sold the women and children into slavery (LOM p. 464, and referred to in Sura 33:26). Muhammad also had killed: three slave girls who had made fun of him; a mother of five as she nursed a child; and numerous other non-threatening civilians. He ordered his followers to “Kill any Jew that falls into your power” (LOM, 369). At a Senate hearing Thursday, an Obama official with the Pentagon tried to assert that detaining terrorists at Gitmo helps the terrorists recruit more terrorists. Therefore, we should release them. Aside from the asinine logic of freeing knownterrorists so we don’t possibly attract potential terrorists, such reasoning ignores the fact that terrorist attacks are not caused by American behavior. Violent Jihad didn’t start with 9-11—it’s been going on against non-Muslims, between sects of Muslims, and against the Christian West for 1400 years! Islam has always been a religion of the sword. From the very beginning, Muslims heeded Muhammad’s example and the Qur’an’s commands to use violence to convert, submit or kill non-Muslims. By 637 A.D. only five years after Muhammad’s death they put siege to and captured Jerusalem. By 732 A.D. they had stormed across northern Africa, up into Spain, and had reached the city of Tours France, where Charles Martel (Charles “the Hammer”) saved Europe by repelling them. Muslim aggression then continued throughout the centuries, which ultimately gave rise to a series of crusades over about 200 years beginning in 1095. 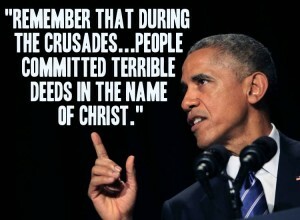 The crusades were a military response to Muslim aggression. They were intended to take back lands Muslims had seized from Christians and to free Christians from Muslim oppression. Christ never said all military action is wrong, and Christians have a robust doctrine of just war theory. In fact, there are times when military action may be obligatory to protect the innocent or to free those being oppressed by an aggressor. (Certainly the war against the Nazi’s was justified, even obligatory after they attacked our allies.) Indeed, you are not loving people when you have the ability and responsibility to protect them from evil but fail to do so. But whether or not the military objectives of the Crusades were justified is irrelevant to my point. My point is that the kind of atrocities committed on the Crusades—like killing Jews —were clearly contrary to Christ’s teaching, but they were just as clearly commanded by the Qur’an and Muhammad himself. We shouldn’t judge a religion by its abuse, but by its truths. Jesus said, “Love your enemies.” Muhammad said, “Kill them.” In Islam, your son dies for God. In Christianity, God’s son dies for you. With all due respect, why can’t the President see the difference?